Sloppy or difficult shifting on a manual transaxle is normally the result of shift linkage adjustment or worn shift linkage components. 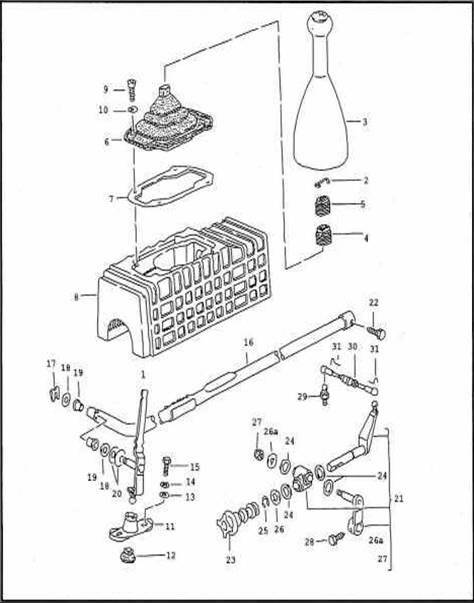 The follow procedure will describe how to check the shift linkages for 944s and 968s. We'll also look at repairing a worn shifter. 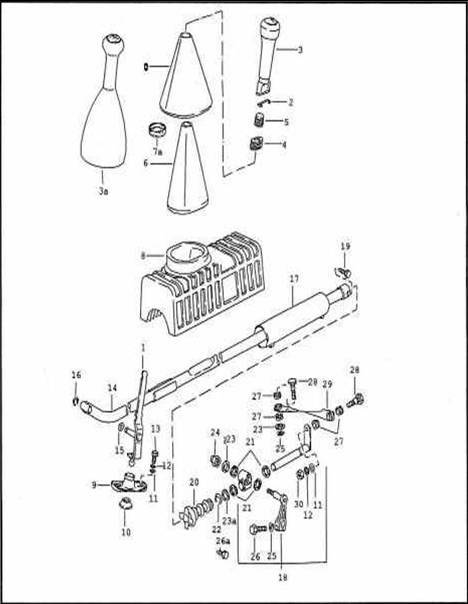 Refer to the pictures below for shift linkage component locations. The locations are given in the procedures below within parenthesis with 944 parts shown first. Sloppy shifting can be the result of a worn shifter (1) pin or a broken bearing shell (10, 12). On the 968 shifter, there's also two bushings (19) for the shifter pin which may be worn and need replacing. Pull up on the bottom of the leather shift lever boot (7) to separate it from the rubber inner boot (6). Pull up the carpet around the rubber boot. Slide a small flat tip screwdriver under the edge of the trim piece at the base of the rubber boot. Push on the clips with the screwdriver to remove the trim piece. Pull up on the rubber shift boot to separate it from the shifter sound absorber (8). Using a probe or small flat tip screwdriver, remove the clip (2) which holds the shift knob (3) to the shift lever (1). Pull up on the shift knob to remove the knob and boot from the shift lever. Remove the rubber inner boot from the shift lever. 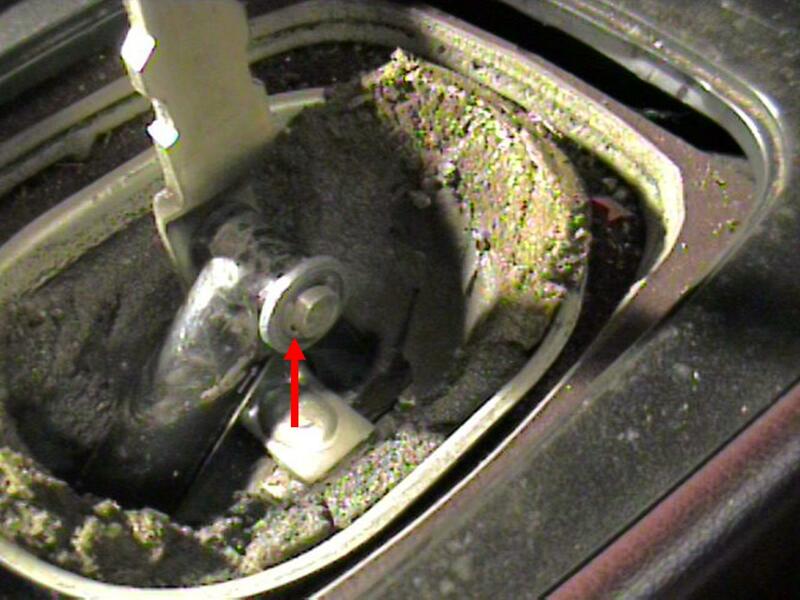 Using a flat tip screwdriver gently pry around the base of the shifter boot (7) next to the console. Be careful not to damage the boot. This will separate the boot and inner trim ring from the console. Pull up on the rubber inner boot (6) to separate it from the shifter sound absorber (8). Remove the rubber vibration dampener from the shift lever. Using a flat tip screwdriver gently pry around the base of the shifter boot next to the console. Be careful not to damage the boot. This will separate the boot and inner trim ring from the console. Using a probe or small flat tip screwdriver. remove the spring clip (2) that holds the shifter knob (3) to the shift lever (1). Then pull up on the knob to remove it from the lever. Remove the four M6 cheesehead screws (9) that hold the shift lever bellows (6) to the top of the shifter sound absorber (8). Slide the bellows up and off of the shift lever. On 944s, remove the "C" clip (16) from the groove on the shift lever pin. Be careful not to drop the clip. Then, slide the shifter rod off of the pin. Remove the washer (15) from the pin and set aside. On 968s, remove the spring clip (17) from the groove on the shift lever pin. Remove the washer (18) and bushing (19) from the shifter rod. You may have to slide the shifter rod off of the shift lever pin to remove the bushing. Remove the other bushing from the shifter rod and the remaining washers from shift lever pin. Inspect the shift lever pin for wear. If it is excessively worn, the pin will be tapered instead of the same diameter along it's entire length. If the pin shows excessive wear replace it. On 968 shift levers, it is more likely that the shift lever bushings (2) will be worn instead of the pin. Check the bushings by sliding them onto the shift lever pin and looking for excessive play. If the bushings show excessive wear replace them. 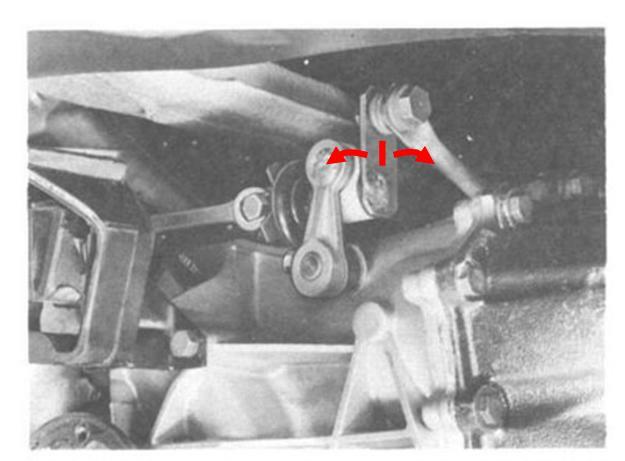 Next remove the shift lever from the vehicle by removing the two bolts (13, 15) that hold the bearing bracket (9,11). Lift the lever out of the sound absorber and inspect the plastic bearing. If it is cracked, broken, or the shifter comes out of the bearing easily, the bearing should be replaced. If the plastic bearing is to be replaced, apply a small amount of Moly grease to the inside of the bearing and slide the new bearing into the bearing bracket. Push the shift lever ball into the bearing. It will be difficult to push into the bearing. That's normal. Use firm, steady pressure but, don't be overly aggressive as you can break the bearing. Install the shift lever into the sound absorber using the two retaining bolts (M8 x 12). Attach the shifter rod to the shift lever pin using the "C" clip (944s) or spring clip (968s). 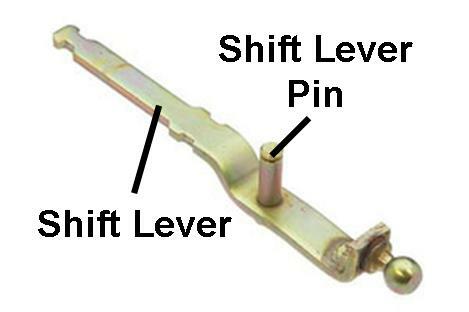 Check the shift lever alignment using the procedure in the following section. On 944s, install the rubber boot onto the shift lever and work the bottom of the boot onto the lip of the sound absorber opening. On 968s, install the bellows (6) onto the shift lever and attach it to the sound absorber using the four M6 x 16 screws. Install the shift lever knob and boot onto the shift lever using the spring clip. Attach the bottom of the boot to the console. There are two adjustments for the shift lever. One is for the inclination toward the front or rear of the car. The other is for the side-to-side inclination. In the factory shop manuals, this is referred to as lateral inclination or transverse inclination. Unfortunately, in the 968 Manuals, it refers to the side-to-side inclination as transverse inclination, and in the 944 Manual, it refers to it as lateral inclination. So, to avoid confusion, we simply won't use those terms. 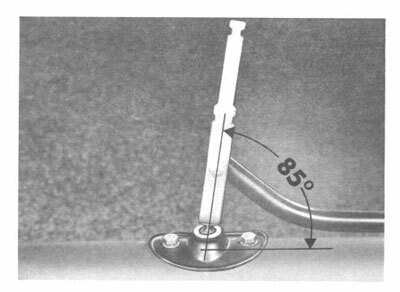 With the shift lever set to neutral, the shift lever should be inclined toward the rear of the car at an 85� angle. If the shift lever is not at the proper angle, loosen (but don't remove) the two bolts for the shifter bearing bracket and slide bracket forward or backward as necessary to obtain the correct angle on the shift lever. Then tighten the two bolts. Also, with the shift lever in neutral, the shift lever should be no side-to-side inclination. In other words, it should not be leaning to the left or right. If so, the side-to-side inclination must be adjusted at the transaxle. Loosen the lock nut on the intermediate shaft linkage (see picture below). Move the intermediate shift lever to the left or right to change the inclination of the shift lever on the console. Moving the intermediate shift lever to the driver's side of the car will incline the shift lever on the console more toward the driver's side. Moving the intermediate shift lever to the passenger's side of the car will incline the shift lever on the console more toward the passenger's side. When the console shift lever is at the correct side-to-side inclination, tighten the intermediate shaft lock nut. Loosen the locknuts (no. 1) on the intermediate shift lever adjustment turnbuckle and turn the center piece (no. 2) until there is no side-to-side inclination at the console shift lever (no. 3). When the shift lever is properly adjusted, tighten the turnbuckle locknuts. The intermediate shift lever at the transaxle shift linkage is partially made of hard plastic (white part in the picture below). Over time the plastic can wear out causing the shifting to become sloppy. If you have already checked and/or replaced the shift lever and shift lever bearing or shift lever bushings (968 only) and there still seems to be some sloppiness to the shifting, inspect the intermediate shift lever for excessive play.